Popcorn Machine hire, Popcorn Cart hire, Candyfloss machine hire, Candyfloss Stall Hire, and . 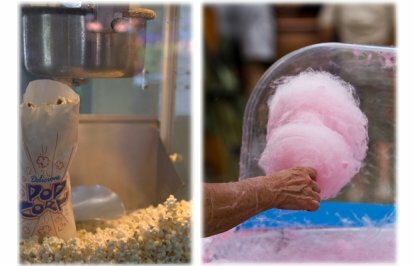 We offer the hire of Popcorn Machines, Popcorn Carts, Candyfloss Machines and Candyfloss Carts for hire for the fun food you'd normally only find at the fayre or the cinema. Perfect for Corporate Events, Receptions, Parties, Promotions, and Exhibtion Stands (see below) these Popcorn and Candyfloss Carts and machines are available for hire either with a member of our staff who will produce and serve the popcorn and candyfloss on your behalf or you can hire on a DIY basis is preferred. The Popcorn Machines are supplied complete with raw corn, serving bags and all other consumables required for the agreed number of portions. The Candy floss Machines are supplied with the mixture ready prepared and with either serving wooden sticks or paper cones depending on your preference. 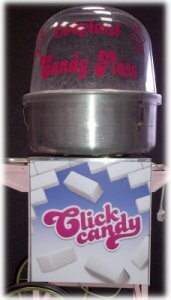 Both the Popcorn Machine and Candyfloss Machine are available as either table top machines, on carts, or promotional stands. Candyfloss is available in either the traditional Pink Vanilla, Blue Raspberry, Lemon Yellow, Green Apply, Orange, or even Banana flavour. Popcorn can be produced Sweet or Salty, or Plain with sugar and salt shakers provided for customers to add themselves. If running the Popcorn and Candyfloss machines together you'll need an overall space of 6x4ft. Access to a single 240volt mains socket will be required although we can supply a generator for electric at an additional cost for outdoor hires where theres no mains electric available. Other 'Fun Foods' we can provide for your event are our great new pedal powered Smoothie Bike and Pick and Mix stand hire. Everyone loves free food and having a Popcorn machine or Candy Floss machine on your exhibition stand is guaranteed to have the crowds flocking to your stand. 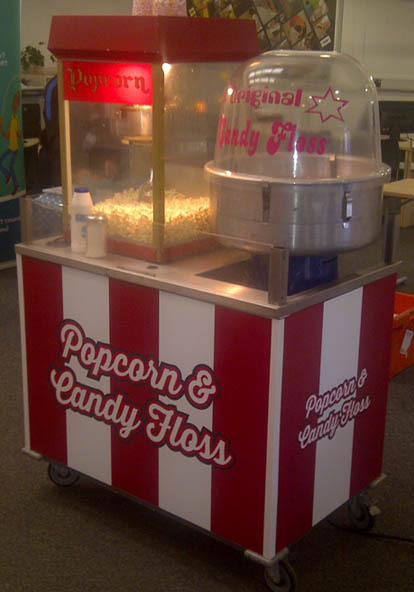 Both the Popcorn and Candy Floss machines can be supplied on small carts that can be decorated with foamex, or similar, branding panels or we have stands specifically designed for promotion use at exhibitions which can be fully branded as required. For added novelty we can produce the candy floss in either pink, yellow, blue, or green so it can be matched to the colour of your branding if required. Being based in Lichfield we're just 30minutes away from the Birmingham NEC (National Exhibition Centre) and its complex of 20 exhibtion halls and we supply many events held at this venue so are familiar with its layout and the delivery collection procedures which always helps things go smoother. The East Midlands Conference Centre, National Motorcycle Museum, Ricoh Arena, Staffordshire Show Ground, Stoneleigh Park, and Telford Exhibition Centre are other venues that are all less than an hour away from us. Being based in the heart of the UK we're perfectly placed to cover a huge area within an hour or twos drive. We cover all of the following areas and more besides so if your area isn't listed just ask! All wording, phrases, and pictures are copyright of Lichfield Inflatables. Those copying our text or images have been and will continue to be pursued through all legal channels.